Home Minister Rajnath Singh on Tuesday rejected suggestions that RSS chief Mohan Bhagwat's quota review remark had a negative impact on NDA's poll prospects in Bihar and said social equations of the 'Grand Alliance' had cost the BJP-led grouping dearly. Singh also asserted that Prime Minister Narendra Modi cannot be held responsible for NDA's humiliating defeat. "Bhagwat's statement was not damaging. It was nothing controversial. We can't think like that. He had only said that reservation should continue," Singh said. Bhagwat had said there is a need to have a fresh look as to who should get the benefit of quota, in comments that kicked up a political storm ahead of the Bihar polls. The Home Minister said this when asked whether the RSS chief's statement favouring review of reservation policy had a negative impact on the prospects of NDA. "Social equations of Mahagathbandhan hamare upar bhari padi (social equation of Grand Alliance cost us dearly)," he told reporters at a 'Diwali Milan' in New Delhi when asked for reasons for NDA's defeat. The winning alliance comprised JD(U), RJD and Congress. The Home Minister laughed at a question whether Modi will resign as Prime Minister taking moral responsibility for the BJP defeat, asking, "what kind of question is this?" "It's BJP's loss and not of the Prime Minister," he said. Singh, a former BJP chief, also ruled out the possibility of party chief Amit Shah being removed over the Bihar debacle. 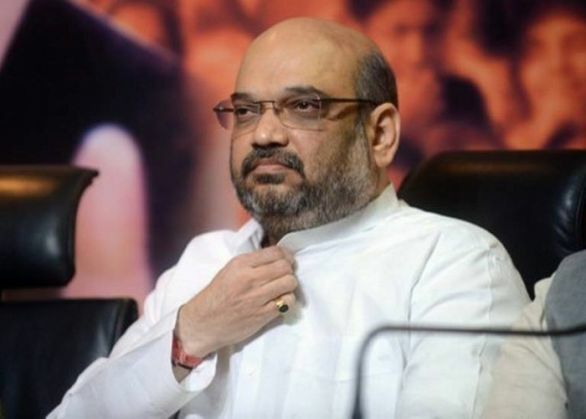 "Amit Shah will remain as party chief for six more years. There is no hurdle. In fact, he got one and half years of my own tenure (as party chief) when I had moved from the party to the government. After that he is entitled to two terms (of three years each)," he said. Singh said the BJP will study and analyse all aspects of party's defeat in the polls and will take action accordingly. "Victory and defeat are part of the democratic process. We had won elections in the past, we had lost elections in the past. We will not do justice to future if we decide future only on the basis of one elections," he added. The Home Minister was candid in admitting that the results had puzzled him as he had seen good public presence during 50 rallies addressed by him. Asked about controversial statements made by some of the party leaders to whip up communal tension, Singh said "if there is any secular party in the country, it is BJP." Asked about the possibility of BJP joining hands with JD(U) in case the Nitish Kumar-led party parted ways with Lalu Prasad's RJD, the Home Minister said he would not like to talk about such scenarios as the mandate was for the JD(U)-RJD combine. "I don't want to talk about that. It is not proper. We want a stable government in Bihar. They got a mandate. Let them run the government," he said. Asked to comment on apprehensions among certain sections that with the return of RJD, 'Jungle Raj' may return to Bihar, Singh said, "Let them form the government. Future will decide how they run the government in Bihar". Singh also ruled out any negative impact over the Bihar debacle on BJP's prospects in the Assembly elections in Uttar Pradesh scheduled for 2017. "We are fully confident about UP," he said. Asked why BJP lost in Bihar despite the Prime Minister having held so many election rallies, he said every Prime Minister must have an interface with the public and election rallies in Bihar were that interface. On the allegation that arrogance had crept in among certain leaders of BJP after the Lok Sabha poll win, the Home Minister said that, had it been the case, the party would not have won Assembly elections in Haryana and Jharkhand and civic body polls in Ladakh, Assam and Kerala, which was "unexpected". "We accept the defeat. We have lost in the past, we have won too. Before the Lok Sabha polls, many people had said that NDA will not get majority. But BJP on its own got absolute majority," he said. On whether action would be taken against leaders like Shatrughan Sinha and RK Singh, who had expressed resentment against the BJP leadership for certain decisions vis-a-vis Bihar polls, he said there was no such discussion at the BJP Parliamentary Board meeting on Monday. Asked if the Bihar results had given an opportunity to opposition parties to revive the 'Third Front', Singh said it was unfair to draw any conclusion just because of one BJP defeat. Replying to another question, Singh denied that the Prime Minister had ever spoken about the DNA of Nitish Kumar. The Home Minister also dismissed the suggestion that several BJP leaders were not listening to party chief Amit Shah and continue to make controversial statements. "How the party is standing if no one listens to the party president," he said. Singh said that BJP will analyse the reasons for the party not having fared well when there was a direct fight with any party or combination and would try to improve the position. Meanwhile, asked about the possibility of a reshuffle in the Union Cabinet, the Home Minister said that was the Prime Minister's prerogative. Asked whether BJP will project chief ministerial candidates in the assembly elections in Assam and West Bengal scheduled to be held early next year, the Home Minister said so far there has been no discussion on the issue at all. "When the election comes, we will decide. The BJP Parliamentary Board will take a call on it," he said. Commenting on certain litterateurs and artists returning awards alleging growing intolerance in the country, Singh said he was ready to discuss any suggestion given by them. Asked why the Prime Minister was not reacting to the protests of the litterateurs and artists, the Home Minister said it was not proper to expect the Prime Minister to comment on each and every issue. "I have commented as it was in my domain," he said. Asked for his reaction on film star Shah Rukh Khan's comment on alleged growing intolerance, Singh evaded a direct reply and said, "Shah Rukh Khan is a good actor."